Website Design & eCommerce for Small and Startup Businesses. created with your best interests in mind to let your business blossom. David helped us define the best presentation, always adapting to our own ideas, and his patience was a huge reassurance. 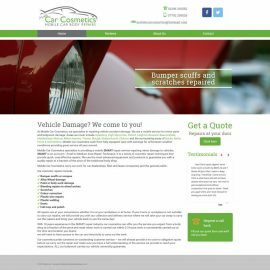 We are very happy with the result and would recommend DB Website Design without hesitation. Why choose DB Website Design to design your website? I have a wealth of experience designing websites, and as a one-person business, I don't have departmental costs and other overheads that other companies do - meaning that the savings are passed on to you! With experience managing an independent business for over 10 years, I know how important it is for you to not feel bound to costly and often unnecessary service fees. That is why after I have finished designing your website and it's up and running, you can update and change your site whenever you wish, on any computer or tablet and without the need for any special software. I will of course still be on hand to help whenever you need. And if required, I can update your website for you after it has launched. Responsive Website Design - looks good on desktops, tablets and smartphones.